Venice attraction-guides.com - Venice, Italy attractions guide Venice Ponte di Rialto, Bridge information about attractions, Grand Canal, Michelangelo, Palladio, Sansovino, Antonio da Ponte, famous city bridge, location and address, general tourist information about Ponte di Rialto (Rialto Bridge) in Venice (Venezia) area, Italy (Italia) IT - Last updated 30/10/2012. During the late 16th century, Venice held a famous competition to design a stone bridge that would replace earlier wooden versions across the Grand Canal. Many of the best architects in Italy submitted entries, including Michelangelo, Palladio, and Sansovino. The winning Ponte di Rialto (Rialto Bridge) was designed by the Antonio da Ponte and concentrated more on the actual structure, rather than on fancy detail and elaborate decoration. 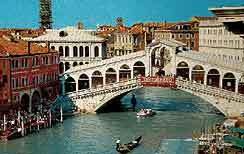 The original design of Venice's Ponte di Rialto (Rialto Bridge) also kept costs to a minimum, which was important at the time, as the finances of Venice were low as a result of opening of oceanic trade routes and also recent wars against the Turks. Venice's Ponte di Rialto (Rialto Bridge) soon became the most famous of the city's bridges and tourist attractions, with many speciality shops nearby.